How can iPhone brick breaking games be improved on? Lemon Games SL is selling one of the best Breakout based games I’ve ever played in the App Store. This iPhone game has impressive visuals with a variety of power-ups, settings, and puzzle combinations. There are four difficulty levels to choose from but you’ll have to stick with it on the profile you’ve created. From kids to hard difficulty, I think Ricochet Infinity can be enjoyed by anyone. 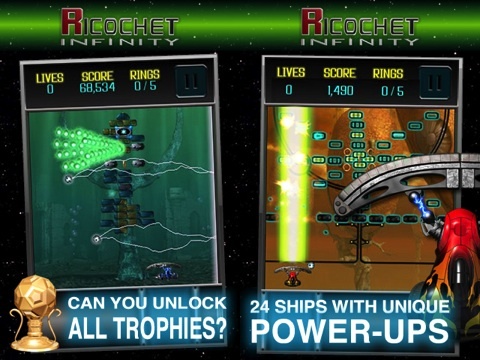 Ricochet Infinity requires iOS 3.0 or better and can be played on the iPhone and iPod Touch. Controls are simple since all you need to do is use a slider to move the paddle (ship with a curved bumper) left and right and tilting your device left or right to control your ball and try to break all the bricks onscreen. Each difficulty level is different such as kids difficulty always has a safety bumper at the bottom of the screen while hard features a faster ball speed but gives more points. There are many things to keep an eye out such as your ball, positive and negative power-ups, gold rings, etc. Power-ups are used when your ship touches them. Some positive effects are an extra life, slower ball speed, and weapons such as a lightning ball, guns, and a laser beam. Some negative ones are taking away a life, faster ball speed, and freezing your ship. Most ships have positive and negative power-ups that activate when you pick up a ship power-up. There are five gold rings in each level and collecting them will unlock ships and balls. The ships have various effects while the balls have a different look. Some problems that I have with the game are lack of an in-depth tutorial and mechanics, the size of the graphics, and no end of stage restart. The puzzles and how the stage looks is what changed my opinion on the brick breaking genre. Each stage usually lives up to its name such as submarine featuring a submarine that has a radar sound effect. Ricochet Infinity is a very fun take on brick breaking games. The graphics are small but are very detailed. The background is also detailed since it can have flying vehicles and an underwater stage with air bubbles and fish. This game has a variety of colors and feature block formations of ships, musical instruments, and other things. You can tell if a power-up is negative since it is red but beware of ship specialties. From my experience with this app, I didn’t notice any pixilation. The audio in Ricochet Infinity is above average. The music is used on every stage and the sound effects are what I expect them to sound. Bricks breaking, ball or balls ricocheting off a wall or something, and sometimes hearing something like a submarine radar or a laser charging. I wish the music stage having instruments sound like they do when you destroy those respective blocks instead of the brick breaking sound. There is no iPod music support at the time of this review. Ricochet Infinity is $1.99 on iTunes. There is a lite version for people to try. Replay a stage to try to get all of the gold rings, get a higher score, and/or trying to do the trophies (achievements). Some of the trophies can only be done on higher difficulty levels. Despite some problems, I had a great time with this app. I think Ricochet Infinity is a great game to start and finish the brick breaking genre. 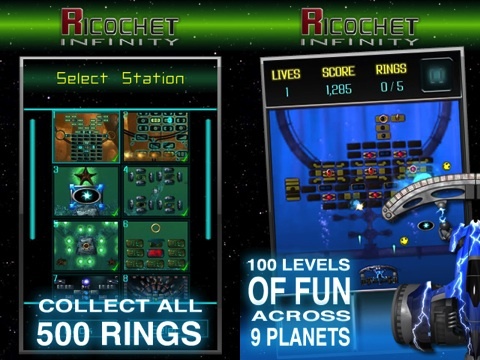 AppSafari review of Ricochet Infinity was written by Tony Lau on July 18th, 2012 and categorized under App Store, Arcade, Featured, Games, Puzzler. Page viewed 4329 times, 1 so far today. Need help on using these apps? Please read the Help Page.